Centre-right parties have triumphed over their left-wing opponents in the 2009 European Parliament elections. There were victories too for far-right and anti-immigrant parties, but the turnout was a record low of 43%. The results allow the centre-right European People's Party (EPP) to cement its position as the largest bloc in the European Parliament. Here we take a more detailed look at the results from some of the European Union's 27 member states. It was a good night for President Nicolas Sarkozy's centre-right UMP party, which took 28.5% of the vote, leaving the opposition Socialists trailing with 17%. The result was even more welcome for the president as he has faced increasing public anger in recent months over his handling of the economic crisis. The BBC's Emma Jane Kirby in Paris said voters decided instead to punish the Socialist Party, which has been plagued by bitter in-fighting. Perhaps the biggest surprise of the night was the strong showing by the green Europe Ecologie party, which took third place with 16%. Turnout was the lowest ever in France for a European election. Only 40% of the 44 million electorate cast their vote. Chancellor Angela Merkel's conservatives trounced their centre-left rivals in what is being seen as a big test of public opinion before September's general election. Mrs Merkel's Christian Democratic Union (CDU) party won nearly 38% of the vote, down from 44.5% in the 2004 EU election. But the Social Democrats (SPD) took just 21%, their worst ever result. Frank-Walter Steinmeier, who will be the SPD's candidate for chancellor in September, admitted the result was "disappointing". The bigger winners of the night were the smaller parties, with the liberal Free Democrats (FDP) taking 12%, up from 6% last time, and the Greens taking 11% of the vote. Just over 42% of Germany's electorate voted for the 99 seats in the European parliament. Prime Minister Silvio Berlusconi's centre-right People of Freedom (PDL) party took around 35% of the vote, securing him victory but well below his target of 40%. The anti-immigration Northern League - an ally of PDL - saw a boost in support, claiming 11% of the vote compared with 8.3% in last year's general elections. The centre-left Democratic Party (PD) came in second with around 28% of the vote. The BBC's Duncan Kennedy in Rome said the result was not quite the decisive blow Mr Berlusconi - who has been hit by a series of personal scandals in recent weeks - had hoped for. But Italians still appear to be more comfortable with Mr Berlusconi's centre-right agenda, particularly on immigration, our correspondent adds. Turnout was one of the highest in Europe, at around 65%. The ruling centre-right Civic Platform was the big winner, securing around 45% of the vote. Prime Minister Donald Tusk said his government had been given "a new vote of confidence". Correspondents say Poland has so far been affected by the global economic crisis much less than the rest of Europe so far. The BBC's Allan Little in Warsaw says Civic Platform's strong performance will give it a powerful position within the EPP, the main bloc in the parliament. The Eurosceptic opposition Law and Justice party took nearly 30% of the votes, while the leftist Social Democratic Alliance came third with 12%. The turnout was reported to be 27%, up from 20% in 2004 but nowhere near the 53.8% in the last general election. Socialist Prime Minister Jose Luis Rodriguez Zapatero is coming to terms with his first ever election defeat in a nationwide poll. His ruling Socialist Party took 38.5% of the vote, beaten by the opposition conservatives who took 42.25%. The remaining six seats in the European Parliament will be taken up by smaller parties and nationalist groupings such as the Catalans and the Basques. The key factor in the election is the economy, the BBC's Steve Kingstone in Madrid reports. Spain has the highest unemployment in Europe and the recession is said by some to be the deepest since the Spanish Civil War of the 1930s. The one consolation for the prime minister is that the next general election is still three years away, by which time he will be hoping that the economy has recovered, our correspondent says. It was a terrible night for the ruling Labour Party, which took just 15.3% of the vote - its worst result since World War II. The party came third behind the UK Independence Party (UKIP), which campaigns for Britain's withdrawal from the EU, which took 17.4% of the vote. One of the significant results of the night was the success of the far-right British National Party, which gained two seats in Brussels - its first wins in national elections. The centre-right Conservative Party was the overall winner with 28.6% of the vote - increasing its share by just over 1% - while the Liberal Democrat party came fourth. The results are likely to pile further pressure on Prime Minister Gordon Brown, who is facing growing calls from within his party to step down. The two main parties in the governing "grand" coalition, the conservative Austrian People's Party (OeVP) and the centre-left Social Democrats (SPO), came out top with 29.7% and 23.8%, but both lost ground. The Socialists fared worse, however, with their share of the vote dropping 6 percentage points. The main beneficiaries were the Eurosceptic list headed by Hans-Peter Martin, which won three seats, and the far-right Freedom Party (FPOe), which won two. Turnout was just under the EU average at 42.4%. The governing Bulgarian Socialist Party (BSP) of Prime Minister Sergei Stanishev took a hammering in polls seen as a dress rehearsal for the country's parliamentary election next month. The party, which has been accused of failing to tackle corruption and organised crime by critics within Bulgaria and the EU, took 18.6% compared to 24.5% for the centre-right opposition, the Citizens for the European Development of Bulgaria (GERB). Bucking the European trend, Prime Minister Costas Karamanlis's governing conservative New Democracy (ND) party saw its support fall by more than 10 percentage points to 32.3%, leaving it with two fewer seats. The opposition socialist Pasok party captured 36.7% of the vote. The Communist Party (KKE) finished in third place with 8.35%. The BBC's Malcolm Brabant in Athens says that given the corruption scandals that have engulfed the ruling conservatives in recent years, the defeat is not as brutal as it could have been. However, he says, nearly half of voters showed their contempt by boycotting the polls, with many going to the beach instead. This in a country where voting is compulsory and people are passionate about politics, he adds. The two parties in the ruling coalition, the Social Democrat Party (PSD) and Prime Minister Emil Boc's centre-right Democratic Liberal Party (PDL), broke a regional pattern of opposition victories by emerging first and second with 30.8% and 29.8% respectively. The far-right Greater Romania Party (PRM), an ultra-nationalist grouping which accuses the large Hungarian minority in Transylvania of disloyalty to Romania, won 8.7%. In 2008, it was voted out of the Romanian parliament. Former model Elena Basescu, the daughter of President Traian Basescu and dubbed during the campaign the "Paris Hilton of the Carpathians", won a seat as an independent with 4.23% of the vote. Turnout was 27.4%. The day's biggest winners were the centre-right opposition Fidesz party, which won 56.4% of the vote and 14 seats. The far-right Jobbik ("For a Better Hungary") party also performed stronger than expected, finishing just behind the Socialists with nearly 15% of the vote. Jobbik, which blames the Roma, or Gypsies, for a perceived breakdown of law and order in the countryside, took nearly 15%, giving it three seats. The liberal Alliance of Free Democrats (SZDSZ) was almost wiped off the political map, attracting only 60,000 votes or 2.2%, compared to more than a million in the country's first free elections 19 years ago. The far-right Party for Freedom (PVV) of the controversial politician, Geert Wilders, stormed to second place with 17%, winning four seats in the European Parliament in its first attempt. Mr Wilders is facing prosecution for making anti-Islamic statements, following a Dutch court ruling in January. The two main parties in the Dutch government, the Christian Democrats (CDA) and the Labour Party (PdvA), suffered a marked decline in support. The BBC's Geraldine Coughlan in The Hague says Muslim integration and anti-EU sentiment seems to have contributed to the Freedom Party's success - but that the message from voters is still mixed because pro-European parties also did well. Turnout was 36.5%, lower than in 2004 but higher than in 1999. With the results of seven out of 12 seats still to be declared, the final outcome of the European election in Ireland is unclear. However, exit polls published by the broadcaster RTE on Sunday night suggest the opposition Fine Gael and Labour parties will be the big winners, with 30% and 16% of the vote respectively. The governing Fianna Fail is predicted to win just 23% in the wake of the recession that has gripped the country. If correct, this would be the first time the party has failed to come first in an Irish national or European vote since 1932. The anti-Lisbon Treaty group Libertas looks unlikely to win a seat after its leader, Declan Ganley, came fourth in the first count in his region. However there were disputes over the handling of the count. Turnout was 57.6%, considerably higher than the EU average. Prime Minister Jose Socrates's Socialist Party saw its share of the vote drop 18 percentage points to 26.6%. The Greens and far-right parties were the main beneficiaries. The main opposition conservative Social Democratic Party (PSD) also did marginally worse than in 2004 with 31.7%. Mr Socrates described the results as "undoubtedly disappointing" saying they had fallen well short of his party's expectations and taking responsibility for the losses. The Socialists face parliamentary elections in September. As elsewhere in Europe, it was a good night for the centre right in the Czech Republic. Former PM Mirek Topolanek's conservative Civil Democrats (ODS) clinched nine of the 22 seats up for grabs after winning 31.5% of the vote. Mr Topolanek said those who voted for his party had given "hope to the whole country". The left-wing Social Democrats (CSSD) took 22.4% and seven seats, followed by the Communists (KSCM) on 14.2% and the Christian Democrats with 7.6%. Turnout in the country which currently holds the EU's rotating presidency was low at 28.2%, well below the EU average of 42.9%. The BBC's Rob Cameron in Prague says all eyes are now on October, when Czechs reluctantly go to the polls again. The opposition Social Democrats came top with 20.9%, but saw their share of the vote drop by 11 percentage points and consequently lost a seat. The governing Danish Liberal Party held onto its three seats after winning 19.6%. The Socialist People's Party came third with 15.4%, followed by the populist, right-wing Danish People's Party (DF) with 14.8%. Turnout was 59.52%, 12 percentage points more than in the last election. The new Pirate Party, which advocates shortening the duration of copyright protection and allowing non-commercial file-sharing between individuals, won a seat in parliament with 7.1% of the vote. Rickard Falkvinge, the party's leader, told Swedish TV: "We are writing history and we are securing civil liberties in Sweden, Europe and the world." The opposition Social Democrats took five seats after getting 24.6%, while the governing Moderate Party came second with 18.8% and four seats. Turnout was slightly higher than the EU average at 43.8%. 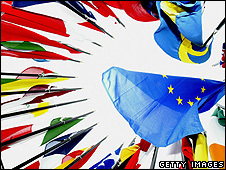 Sweden is next in line to assume the EU's six-month rotating presidency, in July. The three largest parties took between 17 and 23% and each lost a seat. The small Greens and Eurosceptic True Finns saw a strong rise in support, receiving 12.4% and 9.8% respectively. True Finns leader Timo Soini won 130,400 direct votes, more than any other candidate. Miter Repo, an Orthodox priest who was defrocked for the campaign, won the third most votes on a Social Democratic ticket. The small Swedish People's Party also defied predictions by retaining their one seat.